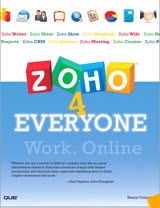 “Zoho 4 Everyone,” by Nancy Conner; $23. “Google Docs 4 Everyone,” by Steven and Nancy Holzner; $18. Both these books are available at informit.com/que and most bookstores. Now that Sun Corporation has been purchased by Oracle Corp., there are some doubts that their free office suite “Open Office” will continue to be available. Open Office essentially duplicates most of the features of Microsoft Office. If it goes down the drain, here are two alternatives. Unlike Open Office, they both exist online, not on your computer. Zoho has about a million users so far and can be seen at Zoho.com. The Zoho “cloud,” as they like to call it, contains word processing, spreadsheets, accounting, email and numerous business forms. You can also use it for conferencing and sharing message strings. You can create your own “wiki,” which is a kind of unbounded collection of comments and information on just about anything anyone in your group wants to put down. Google Docs has millions of users, is also free and also duplicates many of the features of Microsoft Office except for the database. Joy uses it all the time. It’s been around for several years and is easy to use; anyone can sign on in a few seconds. Anything created in Google Docs can be downloaded to your own machine and edited off-line. Google Docs have numerous special routines for creating business documents and presentations. These are called Google “gadgets” and they have been created by many users; all have to be approved by Google itself.